I love the quilting. It really adds to the quilt. Great job getting it done so fast! 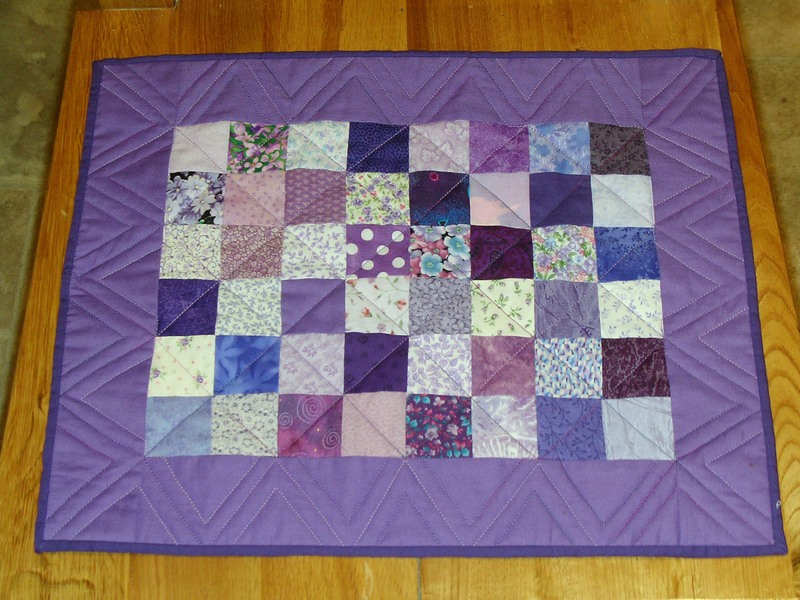 Very pretty violet quilt. Thanks for the idea. I will be making my granddaughter a doll quilt. Very cute. Great idea for the quilting motif in the border. Beautiful little quilt and great colors! Thats adorable, I love the quilting on it!!! on February 7, 2011 at 3:28 am | Reply katie z.
It’s really beautiful! Love the colors. You are sooooo talented! Ooh, beautiful! I have never made a doll quilt – but I will get there with all these cute sampels out there! Very cute. I have never made a doll quilt, they are a great idea. Darling little quilt. Missed seeing your work recently and glad you are posting again. I didn’t finished my quilt this month and was thinking that next month I will make a doll quilt, and now I have a adorable sample…… I love it!